Every girl dreams of having a fairytale wedding. We do wait for this day all our life and do everything possible to make it a memorable and unique wedding. From venue to make-up artist and food-menu to décor, we do no comprise on anything. Be it bridal lehenga or jewellery, we want it exclusive and exceptional. With modernization in fashion industry, we got a long style list for both Lehenga and Jewellery, we got elite colors for lehenga and extraordinary jewellery sets. Whether you go for silver jewellery or handmade ones, every kind of jewellery got its own charm which makes the bride more stunning. Be the classy chic looking bride and call it vogue with Kundan! 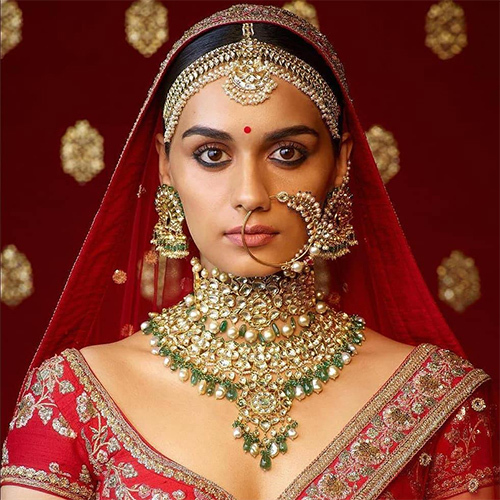 When it comes to bridal jewellery, what’s better than a Kundan piece!? It has become the first choice for every bride. Kundan is known for its bold and beautiful significance. The necklaces and other jewellery pieces are not very complex but they look better than every other jewellery piece. Just a Kundan necklace and you are all ready to go out being the best looking bride and garnered all the attention. Be a conventional Indian bride with the stone studded jewellery! Stones have been in trend ever since. It’s still the first preference for conventional Indian bride look. From pre-historic queens to B-town actresses, stone studded jewellery pieces never fail to amuse any women. They will never disappoint anyone and make sure everything falls into place for you. Whether you go contrast colour or same as lehenga, it will surely game up your style level up in minutes. 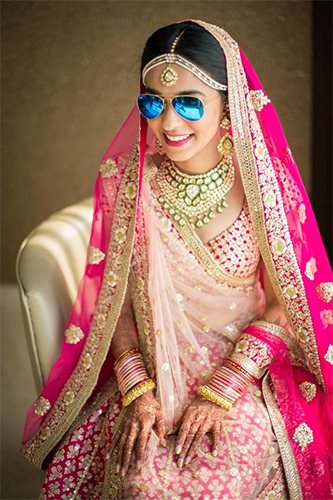 The heavy designed necklace and maangtikka look the best on bride. Sway like a modern and attractive bride with silver jewellery! Are you also one of those who have the myth that silver is not for wedding!? Well, with fashion world moving and updating itself every day, silver is the new gold! From stylish statement earrings to heavy bridal necklace, silver exists in every type of jewellery piece. Cherry red and maroon are old choices with new and beautiful colours added in the list of bridal lehenga. To match the beauty and uniqueness of these colourful lehengas, silver is there like a savior. When in doubt go for gold, even in your wedding! 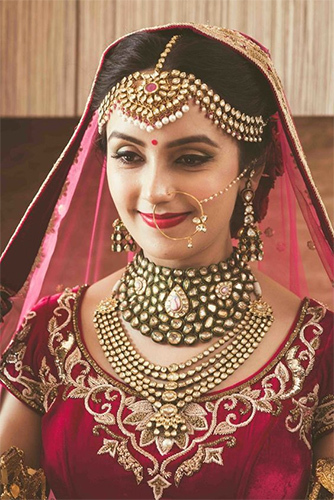 Have you ever seen a bride looking dull with pure gold jewellery? I know, you haven’t! Be it south Indian or Maharashtrian brides who prefer to wear only gold in wedding for several reasons. 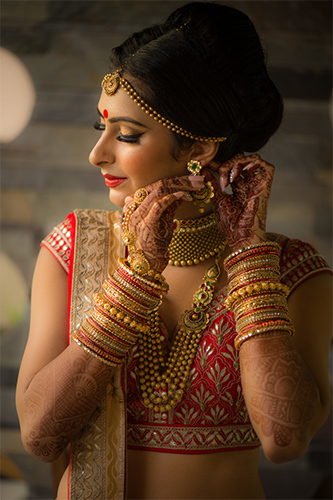 These brides and weddings are known for their complex and beautiful gold jewellery sets. The gold bridal jewellery gives a look like no jewellery can. It brings out the best of the bride and as they say old is gold; the brides actually look like Indian goddesses carrying gold jewellery. Whatever kind of jewellery you choose just make sure that it matches perfectly with your lehenga and bring out the best of you. Hold that beautiful smile and have a memorable wedding!